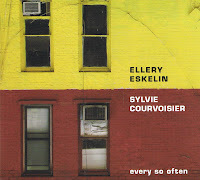 Saxophonist Ellery Eskelin and pianist Sylvie Courvoisier are both wonderful stylists, who master jazz and modern music perfectly, in all their subgenres, settings, line-ups and other ramifications. Last year they played this great trio album, "As Soon As Possible", with Vincent Courtois, looking for new sounds and modes of expression, a journey they continue here in a duo environment, equally improvised, and even if it is a notch less adventurous, it has a nice warm touch to it. The recording quality of this album is superb, sounding as if both musicians are playing next to you, which gives a nice feeling of closeness and being part of the music. All nine tracks are fully improvised, yet each piece has its distinct sound, elaborated upon by two musicians who can communicate feelings and musical insights as if the approach had been discussed and agreed upon before. Courvoisier is a more of a conceptualist, creating the atmosphere and the scenery, the unexpected angles, the conflict element. Listen to "Open Channel" and how she manages to sound like a trio on her own, creating a small universe by playing piano, percussion and non-descript sounds from the inside of her instrument at the same time. Eskelin adds the human voice, the sensitivity and an exceptional warmth of tone, never raising his tone, sounding like a velvet caress, but finding within these limitations a broad range of subtle sounds in his instrument that sound fresh, deep, new, unexpected, and so right, so right. The combination works extremely well, from the intimate to the more abstract pieces, and it is not all sweet of course, many pieces are headstrong, obstinate and self-willed, focused on the creation rather than on the listener's reception of it, but that's fine, that makes it interesting and challenging. I love it. 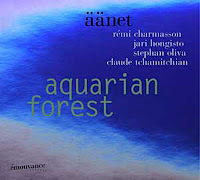 This French trio, with Rémi Charmasson on guitar, Stephan Oliva on piano, and Claude Tchamitchian on bass, is further completed by Finnish trombonist Jari Hongisto, who joined them on their trip to Finland where this album was also recorded. The music is avant-garde, boppish and chamber jazz-like, and the latter not only due to the absence of a percussive instrument, but also because of the intimacy of some of the tracks. Sometimes the three substyles are quite separate, as on the evocative avant-piece "Extérieur Nuit", that brings an eery impression of the forest at night, sometimes they are mixed, as in the wonderful closing piece "Jazz Pretext". Anyone who enjoyed Max Nagl's Big Four, will certainly like this track, which is bluesy, free and boppish.The other tracks bring great adventurous evocations of Finnish nature, with all four instruments remaining within the normal sound range of their instruments, but playing around with musical inventiveness, rapid interactions and some really interesting and expressive moments. Most of the tracks require some open-mindedness and appreciation of avant-garde, but some pieces will be without a doubt to everyone's taste. Recommended. 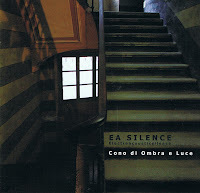 Electroacousticsilence, or EA Silence for short, is a trio with an unusual line-up: Luca Cartolari plays live electronics and electric bass (track 5), Mirio Cosottini plays trumpet and flugelhorn, and Alessio Pisani plays bassoon and contra-bassoon. The bassoon is an unusual instrument in modern music, but on the few albums that I know on which it's played, the quality of the music is high (see especially Kris Tiner, with an almost similar line-up, but also Wayne Horvitz and Bill Dixon). The music brought by the trio is of an extraordinary stylish aesthetic, mixing classical music, sometimes even with a medieval pre-baroque touch, modern music, jazz and electronics. The music progresses slowly, solemnly, with trumpet and bassoon acting in unison, counterpoint, echo, with the electronics repeating the sounds at times, distorting them, or just providing a textural background, dramatic effects or ambient sounds. The music also shifts between composition and improvisation, between crystal clear tones and more diffused tonal explorations. These contrasts, including the sharp difference between the high-toned trumpet and the dark sounds of the bassoon, make for a wonderful tension and musical depth of perspective, a chiaroscurao of sound. Unlike the Tiner-Phillips-Schoenbeck Trio, the sounds here are less intimate, more emotionally distant, more dramatic, but also more magnificent in their slow forward movement, creating a feeling of immense space and beauty. 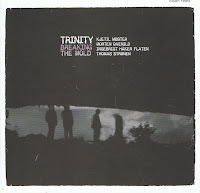 Many have tried this approach before, and fell into the trap of syrupy sentimentalism, but this trio manages to have a consistently coherent unique musical vision, rich in ideas and tonal explorations, austere and disciplined in its delivery. Truly great. Listen to an excerpt from "Medusa"
Usually I read the liner notes only after listening to the music, just to avoid influence. The imagery that came to mind when listening to this album was one of quietly floating water, something untangible, elusive and ever changing without actually losing its form. It floats quietly onwards and onwards, taking turns, going through some rapids occasionally, and ending in the most quiet possible context, when it reaches the ocean, all beatiful and peaceful. Now I read (also in the title, you stupid! ), that it's about air, and that fits even better. 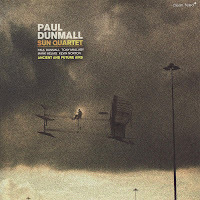 The band consists of Paul Dunmall and Tony Malaby on sax, Mark Helias on bass and Kevin Norton on drums and vibes. And oh, I almost forgot, Dunmall also plays bagpipes in the middle of the long first piece. But don't run away. It doesn't sound like Mull Of Kintyre, not by a long stretch. It sounds like overblown tenor. 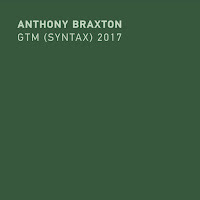 Both saxophonists are easily recognizable on the album: Malaby is an emotional lyricist and Dunmall a raw spiritualist, and their tone is totally different, but even when both are playing on tenor, their match is perfect, intense and warm. And their improvisation brilliant. It is extremely difficult to remain coherent for close to 50 minutes, but these guys manage this well, even if there is not much focus in the piece, but that's clearly not the purpose and it would have destroyed the effect too. Now, you're taken along on a trip (air or water) through varying moods, levels of intensity, but always with the greatest of attention to the interaction. Helias and Norton too add greatly to the overall sound. The interaction between Malaby and Norton after about 30 minutes is of the same high level as Dunmall's duet with Helias some five minutes later, and here is an ear-opener for drummers too: listen to Norton's drum solo, light as a feather, subtle as the wind. And he has the same approach when playing his vibes, with the softest touch, adding color and depth, without creating a real presence. 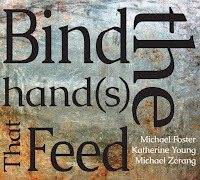 Together they create a vision of wide expanse, in the best Coltrane sense, but lighter even, broader. With no sense of melody, no rhythm despite the variations in intensity, yet so lyrical, so fluent, so sensitive, this music is totally free. The second short track, sounds as an encore for the enthusiastic audience at the Living Theater, and also as a kind of lullaby for the fearless, all sweet and eery. Listen to an excerpt from "Ancient Airs"
One of the best free bop bands of the moment is without a doubt The Nu Band, with four seasoned musicians who are as comfortable in the most complex jazz traditions as in the adventurous sonic explorations of nowadays, mixing them with rhythm, soul, spirituality, a deep-felt sympathy for humanity, a strong dose of political criticism, joined with humor and self-relativation. 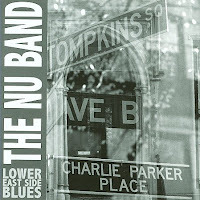 The Nu Band is Mark Whitecage on sax and clarinet, Roy Campbell on trumpet, Joe Fonda on bass and Lou Grassi on drums. The album starts with the boppish title track, in hommage to the place where Charlie Parker lived and worked, with a strong bass vamp and a nice theme, a great springboard for the musicians to start their respective solos from. The second track is more ambitious, penned by Joe Fonda for Mark Whitecage, and called "In A Whitecage", a slow exploratory piece offering both horn-players a framework to interweave their solos, moving in and out of the theme, moving from unison to echoing each other to different phrases to full separate improvisation, with a long bass solo by Fonda making the bridge to "The Path", the piece's second part, which is equally sensitive, but much sweeter. 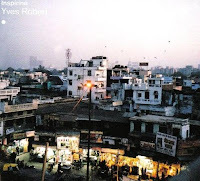 "Connecticut Solution", has a more middle-eastern rhythmic feel, an environment in which Campbell feels extremely comfortable for his slow bluesy, stretched, muted notes, so deeply felt that it gives me the goosebumps. While Whitecage and Fonda perform strong solos, Grassi's percussive power throughout this piece is stunning : economical and rich, creating a wonderful synergetic feel with the repetitive bass-line, and especially during Fonda's solo. 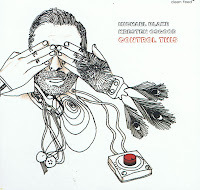 Grassi's compositions for "Drunk Butterfly", "The Last Of The Beboppers", gets its cover here too, and so does his much older song "Avanti Galoppi", which was already covered on several previous releases but still maintains its great forward-propulsing rhythmic drive, the rhythm section quadruple-timing the piece's slow theme, a challenge for the horns to keep the slowness going, a delight for Fonda who clearly enjoys the speed, then almost brings it to a standstill during his own solo, only to get the galopping speed back up for the finale. "Heavenly Ascending" is again a slow, march-like piece, with Fonda's arco leading the way into a soulful and heartfelt suite ranging from very open-ended moments, to joyful unison phrases, wildly chaotic interactions, but ending again with the serene arco. This album will not change your life, nor will it alter music history, but it will offer you all the musical joy you can expect from great music and wonderful musicians: it is rich, soulful, spiritual, fun, varied, expressive, moving, elevating .... Highly recommended. But now that George Bush is gone, who will these guys rage against now???? Listen to an excerpt from "Connecticut Solutions"
Rescued from oblivion, and given a second jazz life by William Parker, Henry Grimes is one of the icons of jazz bass in the sixties, having played with everyone from Benny Goodman to Albert Ayler. And Rashied Ali is possibly best known for his work with John Coltrane in the last period of his life. Since Archie Shepp's "On This Night" (1965), both Philadelphians had not played together again, but here we find them back in this unique duo setting, more than fourty years later, for an improvised set of fresh and open-minded jazz. Both musicians play full of controlled fervor and passion, obviously enjoying the chance to interact creatively. 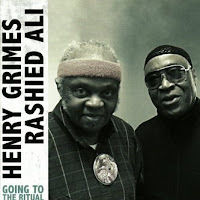 Ali is careful enough not to drown the bass in the volume of his drums, choosing to play losely and supportively, and when Grimes picks up his softly screeching violin, Ali becomes even quieter. But the sound is at its best when Grimes plays arco, which gives the music more voice, more volume, allowing for a more powerful interaction, as on the longest third track "Gone Beyond The Gate". In the second and fourth track, Grimes recites one of his poems, giving a sense of conceptual unity to the album. Grimes has been writing poetry all his life. You know what I think of poetry in jazz, but nevertheless, it does not spoil the fun. Despite the limitations of the setting, the two veterans manage to bring a captivating piece of music, fresh and open. Listen to and buy from Porter Records. 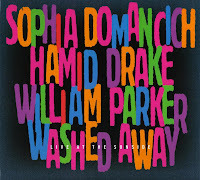 French pianist Sophia Domancich loves Ornette Coleman's "Lonely Woman", just like me, and despite her limited output as a leader, this is the third CD on which she brings the tune. She played it earlier with her band Pentacle and in a duo with Simon Goubert, but here is assisted by the best of the best rhythm section, Hamid Drake on drums and William Parker on bass. The performance was recorded live at the Sunside in Paris in July of last year. Domancich herself is a a long background, having played lots with the Canterbury scene musicians, such as Pip Pyle, Elton Dean, Hugh Hopper, Didier Malherbe. From the little I had heard of her music, it was slightly left of center, but not much, but here, in combination with Parker and Drake, she improvises freely and openly, without boundaries and restraint. The first track "Washed Away" has a boppish backbone, with nice improvisations, the second track, "The Seagulls of Kristiansund", is a Mal Waldron composition, which starts with impressionistic piano, but through his solo, Parker leads the tune into a totally different direction, without altering the overall sound, keeping the gentleness of approach, but making it more organic, less structured, and interestingly enough Domancich takes up the challenge, joining Parker and Drake in their more avant-gardist approach, and slowly moving them back to the impressionism of the beginning, while Parker picks up his bow to add to the melancholy. But of course the highlight is "Lonely Woman", a piece she knows inside-out, here spread over 36 minutes (beating the Cojaniz/Schiaffini performance of the tune by 1 minute), which gives ample space to the three musicians to move through the theme's moments of wonder, surprise, playfulness, anger, melancholy and sadness. In the course of the lang track the focus tends to get a little bit lost, moving the piece into a freeboppish improvisation. Listen to an extract from "Lonely Woman"
French trombonist Yves Robert delivers a wonderfully creative and rhythmic piece of music with "Inspirine", in the not so common format of a trombone trio. Cyrille Atef plays drums on all pieces, and Bruno Chevillon plays bass and Vincent Courtois cello, yet not together. It's always a trio format, although there is some overdubbing. The pieces are composed, well-structured with room for improvisation. The compositions are delightful in their joy and musical fun. All sixteen tracks are compact and dense, packed with ideas and great in their performance. For those familiar with "In Touch", his highly succesful ECM album, despite the fact that it's the same trio (without Chevillon), there is hardly any musical relationship or ressemblance, with the ECM album offering very lengthy expansive pieces. Both albums are excellent, but here the music dances, sings, swings, funks, ... yet it can also switch to more plaintive, melancholy moments, yet keeping a great sense of melody and attention to detail. This is music that is so full of humanity, warm, honest and highly likeable, without pretense and very creative. Listen to an extract from "Between The Bliss And Me". 1. In his book, "This Is Your Brain On Music", psychologist Daniel Levitin writes that sufficient exposure to repeated listens to the same music will familiarize you with the sounds and make you appreciate what you hear, regardless of what your initial reaction is to the music. 2. Sometime in the previous century, I forced myself to like free jazz (as a punishment to myself after I bought an LP which I wrongly assumed I would like), and I then realized how rich, deep and fresh the music sounded even after dozens and dozens of times. So first impressions can be very wrong. 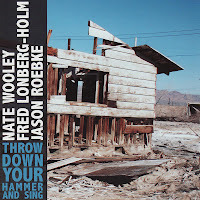 Add to this that I admire trumpetist Nate Wooley, bassist Jason Roebke and cellist Fred Lonberg-Holm, who just released this CD with the great title "Throw Down Your Hammer And Sing". My point is this: I have just downloaded this CD from eMusic. It is very avant-garde, with sounds that are mostly not recognizable as coming from the instruments they play, and that sometimes ressemble organic, almost natural sounds, both in their creation as in their interaction, but sometimes also very industrial, but then in the artisanal way, like wood being sawn, sometimes like cars honking in traffic jams. But as Wooley writes on his blog, it is also very "intimate and human". I have listened to this album four times now. I admire these three musicians too much to discard this music as a waste of time. I will listen to it. I will listen to it many, many times, and let you know what I think of it later, much later. Maybe I should add one thing. I once went to a presentation by a modern classical composer, who made horrible music, but who went so far as to explain his music. The whole audience stayed, and listened to his proud explanation of his music. I could tell everyone was bored, slightly horrified, and wanting to escape asap, yet too polite to run away to safer places. I can imagine this music may generate the same feeling. But I will listen to it till I come to appreciate it, if I ever can. If yes, then Levitin is right, and I am richer with experience. If not, then Levitin is proven wrong, and I am still richer with experience. I want to like this music. 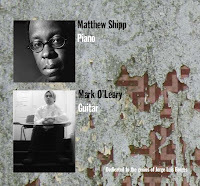 Without making too many concessions to their own personal styles, pianist Matthew Shipp and electric guitarist Mark O'Leary find each other quite well on this duo release of fully improvised pieces. Both musicians have a very broad scope, ranging from more rock-influenced fusion, over traditional jazz, over free to avant-garde and back again. What they demonstrate here is just music. Hard to classify. They interact with notes, often touching upon subgenres, but without falling into known patterns, just driven forward by the thoughts inspired by the other. Some moments are close to romanticism, others close to fusion, or modern jazz, or modern classical, but just little hints, like doors opened yet not entered, weaving interesting musical textures, often rapid and nervous, which seems to be O'Leary's normal musical state, and one which works well with Shipp's dense percussive style, sometimes slow and precise, shying away from clear melody, yet lyrical all the way. 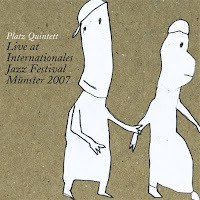 Even if the first piece is very abstract, with the two musicians trying to find common ground, on the second piece, "Secret Miracle", they start echoing each other, slowing down the tempo, and coming up with solutions that sound pre-meditated, but because they are not, the music keeps this kind of floating openness that is hard to grasp or to describe. The unity is enhanced by the two musicians sticking to their lead instruments in their prime use, Shipp playing acoustic throughout, once in a while directly plucking his strings, O'Leary playing his electric guitar, mostly very soft and low-toned, with lots of sustain, and extreme clarity of tone, except on one track, "The House Of Asterion", on which the sound is more distorted, speedy delivery becoming essential, and when Shipp creates a magnificent and dramatic repetitive phrase, O'Leary joins whole-heartedly, drops the theme for some dark improv only to come back to the theme later, changing and exchanging ideas and moods without losing focus. Another highlight of the album are "Mosaic", a slow and eery piece, that evolves quite interestingly, also in tone, despite its coherence. The album is dedicated to and inspired by Argentinian author Jorge Luis Borges, whose approach to literature was quite unique, light and playful on the surface, unintelligible and profound in its underlying meaning, deliberately disorienting readers by leading them into the contradictions of rationality and reality itself, full of surreal images, dreamlike and nightmarish. Both musicians do an excellent job at capturing some of these characteristics. Borges was interested in mirrors, in doppelgänger, symmetries and asymmetries, and Shipp and O'Leary reflect this quite well, soloing together - it's hard to say who is leading who and who plays background for the other, speaking with one voice, only doing different things. 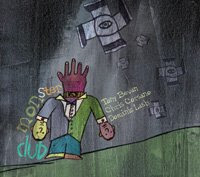 Some tracks, such as "Coptic Night", sound composed, just for its almost telepathic interplay. Very ambitious, very original, very succesful. Boston-based guitarist Jeff Platz made two excellent albums with his two previous bands, "Bright Light Group" and "Skull Session", with himself and Scott Getchell on trumpet as the only continuity, including this new outfit, called the Platz Quintet, with Blaise Siwula on sax, Kit Demos on bass and John McLellan on drums. 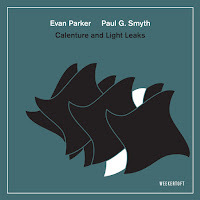 The music is much in the same style as the previous endeavors, high quality improvisations, very rooted in bop in terms of scales and phrasing, but with a very free and open approach to rhythms and composition. Despite the size of a quintet, the music very often has a chamber jazz feel, very intimate, close, sensitive to individual notes and interactions, without any sense of urgency or even need to move forward. This gentle restraint and sense of control, despite the music's natural freedom, makes this such an interesting and worthwhile approach. Without breaking boundaries, the musicianship is excellent, the unity of approach is strong, and the overall quality is excellent. The live performance gives the overall result an additional touch, including spontaneous moments of crowd-pleasing interactive fun, as in "Five Reasons". Nice. Listen to an extract from "It's Like"
With all the respect I have for the Clean Feed label, when I put on this record, I thought, "no, not again", when listening to violent saxes annex electronics, wondering why all this is necessary, even if the album starts quite slowly and relatively quietly, eery and gloomy. But as you grow accustomed to the band's approach (if that's achievable), the quality of the music increases. Again some Scandinavians doing strong things : led by saxophonist Kjetil Moster, the band further consists of Morten Qvenild on keyboards, Ingebrigt Haker Flaten on bass, and Thomas Stronen on drums. So it starts in an interesting way, with plaintive wailing sax against a background of organ, bass, drums and electronics. Slowly the long piece moves into a more tense mode, with organ and sax reacting to each other in small bursts of sound, with interspersed electronics and then, well... all hell breaks loose, as you might have expected. The second, short piece is driven by the electronics and the arco bass, and if it were not for the sax joining after a while, it would be hard to classify this as jazz, yet it sounds good, like an ocean at night, slight wind, no land to be seen. In contrast, the third piece drops you in the middle of a rock avalanche, a weird unrelenting environment from which you can't escape, wondering whether you would even want to. But all that is just the long introduction to the last, expansive, magnificent piece, that drags you along for half an hour of intense musical joy. It starts with a powerful interaction between sax and accompanying instruments, then the intensity drops for some floating mist created by organ and electronics, a barely tangible sound, a backdrop with no foreground. And when the emotional, fragile sax enters, you know you're in for a treat, because of the intensity and the quality of the sounds created, the slow pacing, and the time taken to make each sound come to full fruition and appreciation, but as it goes with carefully built-up tension, it needs release somehow, ... and it does come, gradually, intensifying the silent moaning, speeding up the tempo, increasing the volume, and the explosion does come, expansive, wild, pounding, crashing, screeching, howling, ... What more do you want? I’m very happy to report some great news on David’s journey. The first of the beautiful people who came forward in response to the call for help – this particular beautiful person being Laura Mehr – has passed the screening process with flying colors, and a date – May 5th – has been scheduled for the kidney transplant operation. In the 8 weeks leading up to this, David will of course continue his intensive daily dialysis regimen, and following the operation he will have at least a 3 month recuperation period. To all who forwarded and posted our original email with the critical news of his search, please do the same with this notice and the aforementioned URL so that the good news may be spread as well! here’s to full-on success on May 5th and forward! Creating a unique voice is not easy, and especially not in the very crowded fusion genre of rock and jazz, but what this French band creates is totally unusual, rich and intense. The band consists of Paul Brousseau on keyboards, voice and drums, Maxime Delpierre on guitars and effects, Hugues Mayot on sax, Philippe Gleizes on drums, and Jean-Philippe Morel on bass and effects. This is possibly one of the darkest albums I have heard in years. 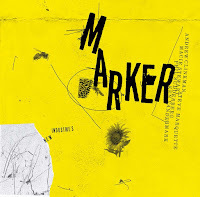 The rock rhythms are heavy, over which slow gloomy, unison themes of sax, guitar and keyboard are woven, with electronics, ambient sounds and the slow declamation of texts in Russian. The rhythmic backbone is industrial, repetitive, like heavy production machinery churning out endless identical products at the end of an assembly line. The great tension in the music arises from the solo instruments, trying to escape this repetitive horror, trying to liberate themselves, complaining, yearning, pleading in the meantime. Once in a while, the tune of the piece becomes joyful, almost ironic, as a sugary coating to hide the horror beneath, as on "Stalker AT79". But beauty has its place too, as the slow sax solo on "FSY Tokyo", played with a background of a-rhythmic bells, metal sounds and undefined scraping. 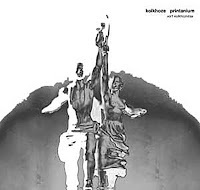 Despite the wide variety of approaches in the 15 tracks, the coherence is extremely strong, including in the art work of the album, which depicts "Worker and Kolkhonitza", a Soviet sculpture made by Vera Moukhina in 1937. The band creates a musical world, something apart, very profound without falling into the trap of exaggeration. It is not about the effects, it's about the music. It is also very French, continuing the roads taken by Camisetas and Limousine, but taking it a step further. There is a little bit more drama, more cinematic effect, more staging, but that's part of the listening fun. Not everything works though, and in my mind the last track could have been left out, but that's a minor comment. Despite the music's dark edge, the ultimate hope for humanity message comes through loud and clear. Absolutely impressive. Buy and or download from CDBaby. Sometimes I get the question: "why do you always give such high evaluations for the albums you review"? The answer is simple: the objective of this blog is to promote music that would otherwise remain under the radar screen of regular reviews (based on my personal opinion). So I only review those albums about which I think that their existence should be made known to those interested. And 300 positive reviews a year, is a tiny fraction of all the music that is being produced. Many labels and musicians send me their new material. And I thank them for that. Unfortunately for them, I do not review everything. I do not see the point in writing reviews about albums that I do not particularly enjoy, unless they're by established musicians, and my review only has value as a kind of alert to those inclined to buy a lot. One suggestion to the many young musicians that send me material: listen a lot to music. And here are some general comments about these demos and self-released CDs. 1. Focus on the music, not on the mastery of the instruments. Many young musicians want to demonstrate their skills, which is fine, but that's not the objective. 2. Make sure the CD has coherence. 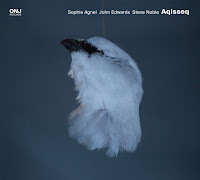 The whole CD will mostly be listened to in one go, so mixing Latin, with bop, and then some free pieces, and then some with electronics, may demonstrate the breadth of the skills, but it does not give the impression of a musical vision. 3. Have something to tell. Why would anyone be interested in buying and listening to your music? What does it do that others did not do? 4. Then don't overdo it. Many CDs I receive try to break boundaries, which is good, but they often go into realms of meaningless experimentation. Experiments are good, as an exercise tool to get new ideas, but they are not the goal. They should be integrated into a musical vision. 5. Many, many musicians have tried to experiment in the same fashion. So it's not because the music is full of noise, or violence, or electronics, that it is new or creative. More often than not it's quite tedious. 6. Create your own voice. A comment closely related to the third point, but try to create something distinct, something personal, something unique. And work on it. 7. It's all about the music. About the emotion, about how formal creativity and instrumental mastery can captivate the heart, mind and body of the listener. Think about his or her listening experience. 8. Be yourself. Understand your emotions, find ways to express their complexity and contradictions. Play what you like, not to impress others. 9. Don't listen to old men like me rambling. Shock old men with new visions. 10. And send me your stuff. 11. If it's any good, I will review it. That's my promise. And objective. The Michael Moore Trio brings us the versatile reedist in the company of Guy Klusevcek on accordion and Erik Friedlander on cello, three formidable musicians, who all share a common penchant for melodious adventure, with a background in jazz but certainly not restricted by genres. On this album they bring no less than 13 pieces, all between two and five minutes long. The "Holocene" is the time period that started 10,000 years ago and continues to the present, or the end of the glacial period. The music reflects some of this timeless peek in history, offering primal sound combinations, sometimes very organic, almost natural, like ice melting, or rain dripping, or birds chattering, as on "Well On Our Way", or melodic, with a light mediterranean quality, as on "Jody Jones", but always light, fragile, almost transparent music. Even on the more somber pieces, such as "Dark Christians", with a gloomy atmosphere, or on the more solemn pieces, such as "Gilgamesh", the lightness and subtlety of touch prevail. 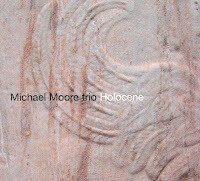 Like on many of his previous albums, Moore explores the boundaries of many musical traditions, moving them into common ground, not of form, but of feeling and depth, giving his music a universal quality which is hard to describe, "holoscenic" may be good description. Excellent album. Listen to "Well On Our Way". Tony Bevan on sax, Chris Corsano on drums, Dominic Lash on bass. The first track is a 2-minute warm-up, to get the muscles working, do some stretching. The second, title track, is a monster truck getting up to speed, slowly at first, but once it has reached its peak of intensity, it keeps it going, full blast, relentlessly, for some eight minutes, after which the whole thing relaxes again. But all that was just setting the scene for what is coming next, a 31-minute track, called "This Is Murder", and it is, in a way. It is absolutely agonising in its physical power, in its emotional power, in its musical power, in its lyrical power, and fabulous in the tension it creates, brilliant in the stark contrast between the violent and the tender moments. Magnificent. The last piece starts slowly, but becomes fierce near the end, and is by itself still fine, but kind of an anti-climax after its ferocious predecessor. Can you create worlds of sounds with just three acoustic instruments? Yes, you can. Does one track justify buying the album? It does! Listen to an extract from "This Is Murder"
Ever since Anthony Coleman's beautiful piano trios on Tzadik, mixing sephardic traditional music with jazz, I have been captivated by the almost seamless integration of jewish traditional scales in a more modern setting, including a kind of emotional closeness, where melancholy and the blues come together as long-lost lovers. Now it's Borah Bergman's term to do the same, but differently, with Greg Cohen on bass and Kenny Wollesen on drums, with John Zorn on sax on one track. Without a doubt the music also made Bergman change his style too, playing more inside than usual, more laid-back on the surface of things, but what he does is no less compelling. He manages to exploit the trio format optimally, that is not only as his rhythmic support, but rather as point of reference and often also as an element of contrast, playing in different tempos, with the rhythm section double-timing the piano, or in full counterpoint. And be sure that Cohen and Wollesen know how to deal with that. The jewish traditional music here is based on cantorial singing, but Bergman is careful enough to avoid the trap of the all-too-easy adaptation into a new format, carefully creating his own kind of interpretation of the material, which is quite modern, reverent and sweet to the ear. The same can be said of Zorn's part on "Luma", and that is also unusual (Zorn? Sweet to the ear? Yes, indeed!). The overall result is not quite in line with what you would have expected, but this more accessible side of Bergman is nice to hear. It is not a revolutionary listening experience, but it will do well for the more tranquil moments of quiet solitude. 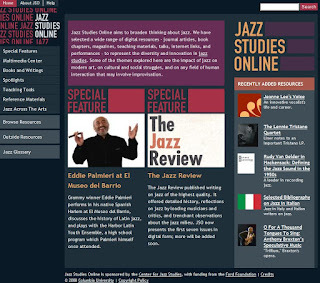 Listen to an extract from "Scattering"
For those who are interested in the "theory" of music, here is a new website dedicated to the topic : http://jazzstudiesonline.org. It has an interesting section on free jazz, on which you can read articles with titles such as "Musical Archetypes and Collective Consciousness: Cognitive Distribution and Free Improvisation". The scope is ambitious, and the quality is good. 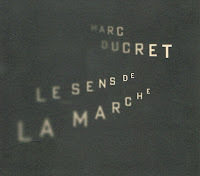 With "Le Sens De La Marche", French guitarist Marc Ducret sets up an ambitious project, combining tightly composed and orchestrated pieces, with room for improvisation and creative excursions, mixing fusion, rock, big band, ambient sounds and even moments that are reminiscent of soundtracks. It is ambitious, because the music wants to tell a lot, with the directness and drive of rock music and the subtleties of jazz, with the power of a horn section, but also adding some grit and dirt in the process, avoiding the smoothness of fusion. It is also ambitious because Ducret started with the project in 2003, working on it over the years, refining, adding, changing, and that's quite clear immediately, there is lots to hear, I mean lots ... a kind of "magnum opus". The band further consists of Bruno Chevillon on bass, Eric Echampard on drums, Antonin Rayon on piano, fender rhodes, and clavinet, Paul Brousseau on keyboards and samplers, Tom Gareil on vibes and marimba, Matthieu Metzger and Hugues Mayot on sax, Yann Lecollaire on clarinet, Pascal Gachet on trumpet, and Jean Lucas on trombone. This is quite a band, and that gives the music a density and heaviness that is not usually to my liking, but it is quite well arranged, with an excellent sound quality, especially because it was recorded live. And as Ducret himself says: "I am too unhappy in the studio". And the audience really appreciates the music, and rightly so, because Ducret manages to infuse fusion with content and creative tension. At moments it reminds me of Zappa in his instrumental period, with sudden shifts and changes. The different pieces all have a suite-like approach, with lengthy elaborations, rapid-fire exchanges, and unexpected variations in tempo. Some moments, such as the intro of "Tapage" have the fun sound that could have come from Zappa, but many other pieces have the kind of dark and menacing seriousness, with a strong emotional component. The one piece that has a totally different quality is "Aquatique", recorded in 2003 already, but in its slow, floating, almost intimate space-jazz style, adding quite an interesting contrast to the rest of the album. The highlight of the album is "Nouvelles Nouvelles Du Front", a 26 minute work-out, that starts in the same vein as "Aquatique", but then moves on with a highly rhythmic forward drive, almost funky, with the full horn section, as soloists and as a band creating some real emotional power. This album is too composed to my liking, as said, but for those of you who are more open-minded to fusion and tightly orchestrated music, it will be a treat. Watch a some extracts on Youtube. This album has all the qualities that you would expect from a fully improvised sax & drums duo: open dialogues, no constraints, the search for intimacy and relevant expressiveness. Michael Blake is a wonderful musician, who - like fellow saxman David Binney - has too many faces to have a very distinct profile, and yet he is truly good in many styles, as an instrumentalist, but especially as a musician, with a great sense for melody and emotional warmth, which makes most of his albums quite accessible, even in the less common format of a duo session, here with Danish drummer Kresten Osgood. Osgood is the perfect match for Blake, because he has the same versatility and sense of lyricism that makes the interaction interesting and enjoyable throughout. One track, "Creole Love Call" has been dubbed afterwards, and although at first listens I found the contrast with the other tracks a little disturbing, but the piece's theme is so beautiful and the fully improvised middle section of the track is so good that I now look forward to listening to it. The improvised pieces have this inviting quality, centered around themes, with an uncannily focused approach, whether it's the nice, almost traditional melody of "Top Hat", or the exquisitely fun, almost visual interaction on "Elephants Are Afraid Of Mice", or the almost telepathic tempo changes on "Cotton Mouth", a rhythmic delight. The long last track ends in some in-the-moment fun between the two musicians, including loud bursts of laughter. Great fun indeed. What makes this album so good is also typical for the label: the musicianship is great, the music is jazz (harmonically, rhythmically), but with a great exploratory approach, .... and it swings! No doubt about it, the unrelenting drive of bass (Joe Morris) and drums (Luther Gray), gives the whole performance a great forward propulsion, with Lantner's piano and Allan Chase's sax taking the lead roles. But the real quality of the music lies in its structured openness. 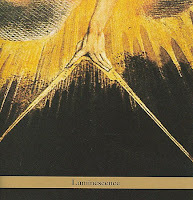 As Lantner describes it in the liner notes: "Harmonically speaking, the sound that I am striving for in my music strikes a balance between consonance and dissonance, and I use the term 'resonance' to describe it. I tend to seek a harmonic middle ground, so that if the music sounds a little too rich harmonically, I try to center it with a more clearly established tonal center. Alternately, as the music becomes too settled with a clear tonal center, I will extend the harmonic pallette". 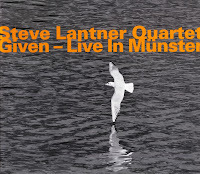 The result is both open-ended and rich at the same time, expressive in the improvisations, with especially Chase doing a great job, alternating his style between staccato blasts to more lyrical expansive playing, and especially the latter works well with Lantner's percussive piano style. Joe Morris and Luther Gray are an exceptional rhythm section (and again, I prefer Morris on bass than on guitar), demonstrating that they have played together a lot, and the third release with Lantner in the lead. Lantner's musical approach of cleverly creative nervously agitated free form can only be appreciated and enjoyed. Listen to an extract from "Given, Part 1"